This boomerang is meant for Advanced Skill Level! 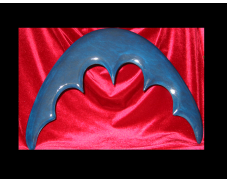 This boomerang was originally created strictly for showcasing - it makes a fantastic conversation piece for your wall, mantle or in a protective case. This boomerang has extremely sharp edges and is very difficult (and painful) to catch - if it hit anyone it could do severe damage! Not meant for people under 18 years old, nor is it meant to be a weapon. However, I have now made a safer version with smoother inner edges which CAN be thrown and does return. We still recommend that people have advanced throwing skills to use these boomerangs, and be over the age of 18. The batarang generally flies a fair distance, and is also fun to watch and is definitely a conversation piece! This boomerang is meant for Advanced Skill Level! This boomerang was originally created strictly for..